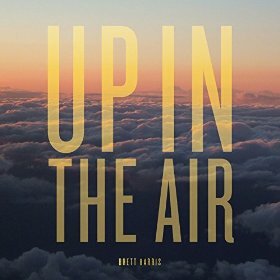 ALBUM REVIEW: BRETT HARRIS, "Up In The Air"
Confessedly, I’ve been a fan of Brett Harris’ since I first saw him perform at the Big Star Third concert in Central Park, New York in 2013, never mind the fact that I had the chance to also enjoy his keyboard and guitar skills when he was the 5th touring member of The (beloved) dB’s in 2012. Aside from his deliveries on those classic Big Star songs, he is an incredible singer/songwriter, which I quickly discovered, quite joyfully, through his 2014 E.P. release, Mr. Sunshine. So you can imagine how much I anticipated something new from the North Carolina resident and I am more than happy with the sounds that emanate from his latest offering, Up In The Air. Ten new songs, placed in “album” formation when you look at the CD’s back cover – divided 5 and 5 and all stellar. From the moment the Revolver-esque riff and harmonies kick in on “End Of The Rope”, it’s just chills of delight and melody – completely singalong and ripe with subtle keyboard touches; “Don’t Look Back” has no less than a fine melody, but the wonderful contradiction is that there is an air of melancholy in the song – a little slower but still filled with sweetness (“…I’d trade all my yesterdays at a chance for one tomorrow…”) and “Lies” sounds like something that would easily fit in on side two of Radio City – tight, tense and yet packing a groove. And “Out Of The Blue” wouldn’t seem out of place in the more subdued style of Big Star 3rd, with its somber and semi-soul/gospel feel and full-bodied arrangements (simply glorious). “Summer Night” slinks along very aptly with a summer-y feel; clean, semi-jazzy guitars and keyboard flourishes on the keyboards that sound like stars falling from the skies make this a very visual track – and listen for the guitar coda in the middle – at moments, it reminds me of the Philly soul of the ’70’s I love with its string arrangements; the title track is a prime example of perfected country-pop, with an upbeat tempo and perfect balance of acoustic guitars and angelic harmonies in the background and “Shade Tree” screams of radio friendly/hit – catchy, full and very reminiscent of Bolan’s best. With so many styles of masterful songwriting in one place, it’s no wonder I knew this album would be as good as it is – and it’s more than good; it’s great. It’s not bias, either. You have to love and appreciate when a songwriter is able to fully realize each song and Brett Harris has done just that with Up In The Air. It’s more than fair to say this young man deserves to have all the accolades that are about to be delivered for this album – because he delivered.